drinkboston.com » Blog Archive » What’s up, crafty bastards? I never could part with the liquor license, so to speak. And it’s a good thing, because I left a few half-empty bottles lying around, and I could use a drink. See, I had an adventure in Los Angeles. Then I drove back to Massachusetts with my Grammy Clark’s American Tourister Bag. Then I got the opportunity to write a book about beer history. Now I’m done, and the book’s coming out at the end of April. 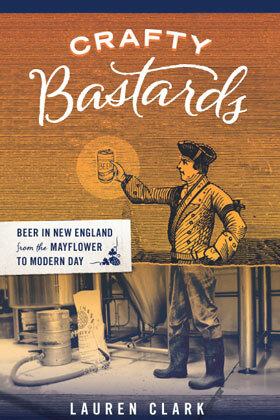 It’s called Crafty Bastards: Beer in New England from the Mayflower to Modern Day, and the fine team at Union Park Press is putting it out. The story starts literally from the day the Pilgrims landed in Plymouth (because they ran out of beer) and ends right about now, in the midst of the current craft beer boom. In between are the Puritans, the American Revolution, rum, cider, the Industrial Era, ale versus lager, saloons, Prohibition, Haffenreffer and ’Gansett and all their brethren, trailblazing homebrewers, David Geary and Jim Koch and the other early New England microbrewers, beer bars, BeerAdvocate, and a few resurrections. There will be many fun and beery book release parties. I’ll keep you posted here and/or at my forthcoming “Hi, I’m an author” website. (Stay tuned.) Or you can follow me on Twitter, Instagram or Facebook. As for this blog … I’m honestly not sure what sort of shenanigans I’ll revive here. So much has happened in Greater Boston Imbibing since July 2011. I’m just starting to catch up! See you out and about. Hey Lauren! Great to be back reading something on DrinkBoston… hope you back blogging again soon. And I’m looking forward to your new book! Aloha! Lauren, congrats! A book about beer sounds great. Let me know when you are in SF. Hopefully your book doesnt suffer from the same blatant product placement as your blog. Best of look with the book but done with the blog. Mee, my book certainly does mention specific breweries, which are commercial enterprises. Is that too blatant for you? Wicked cool. Will there be a book signing up in the Granite State? Of course! Will you be there anytime soon, friend? congratulations on the book Lauren! I am sure it’ll be very informative to your niche. Love to know the difference of an old school beer to a modern beer. Cheers!